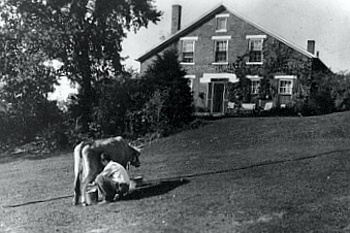 The William Read Home was built in approximately 1850. The home owner had started his business just down the hill by the river and a small stream inlet. His stone cutting operation used a dam upstream to hold water and power his mill operation. The mill site has ruins of this operation built in conjunction with a newly constructed model of the original mill, the Vinegar Mill. Building materials for this pioneer home were harvested and manufactured primarily in the vicinity. Foundation stones and widow sills were quarried at the Vinegar Mill. Native trees of oak and tulip were used for structural framework and flooring. The bricks for the building were baked on the property as well. The brick pattern for this home is very unique. The gable-front house was built in the Greek Revival style. William Read was the son of Samuel Read who built the Jennings County Courthouse. It is reported that William had assisted in this building construction, as well as supplying limestone from his mill for foundation blocks and other elements. The upstairs to the William Read Home had four rooms and a small bathroom used by all four rooms. Behind the Muscatatuck State Park Inn sat three cabins. The dining room would also cater to these occupants. The state dropped the inn services in 1954. Sometime during the Inn's life the public began referring to the building as the "Red Brick Inn". Sometime in the early seventies the William Read Home began being used by the senior citizens of Jennings. The building was dubbed "the Red Brick Senior Center". The senior group was instrumental in the upkeep of this building. In the late 1980's North Vernon developed a new senior center as the elderly population began increasing considerably. The red brick still remained a senior center, yet its activities were decreased. Seniors still use the facility every Saturday evening for their weekly card party. In 1998 the Jennings County Tourism department moved into the building in partnership with the parks department. Although the tourism department moved out in 2009, displays have been added and today the building boasts multiple interpretive displays, pictures and other collections. JCPR office is in the building and staff is glad to answer questions. Many upgrades have been made to the William Read Home over the past 20 years. Both the upstairs and down stairs have been totally redone. In 1999 the park did the painstaking upstairs renovation to the building. This portion of the facility had had minimal use over the last 30 years. The last evidence of use were receipts from 1972. The park removed 6 or 7 layers of paint over the flooring and restored the floor exposing the 1850 milled tulip popular original. The William Read Home is a Jennings County original and can be toured during regular business hours.